We have recently completed the Building Wide Paging System, and the Main Hall, Small Hall and Temple PA systems, and Main Hall AV, Theatre lighting and Theatrical Drapes systems, for this new build Primary School. 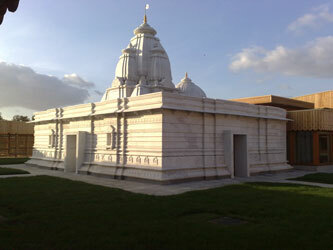 It is a highly notable building, not least for its extreme eco friendly nature of the build, but more for its use, which has it as the first state funded Hindu Faith School. Whilst the LEA will pay to keep the school running, the majority of the funding to build this school came from the local community and from faith partners, I-Foundation and ISKCON UK. To minimise visual intrusion in such a magnificent interior, we used very discrete flat panel speakers to serve the temples PA requirements. 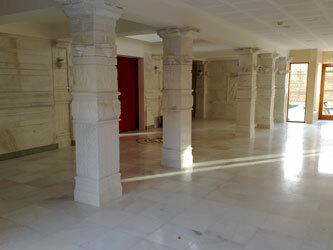 The two halls and the Temple physically link up, so it made sense for the three independant PA systems to link to each other. 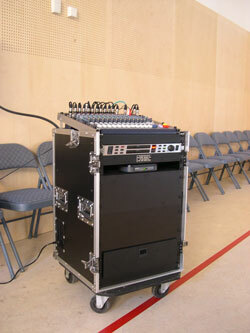 The Small Hall PA rack (below) serves both the Toa Speakers in the Small Hall, and handles audio for the Temple. 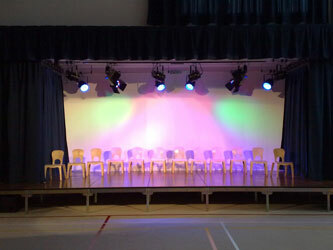 It also sends and receives audio to the Main Hall's PA system, so for large events, all three spaces are combined into one. For smaller events, any two spaces of the three can be combined, or all three can work independantly. 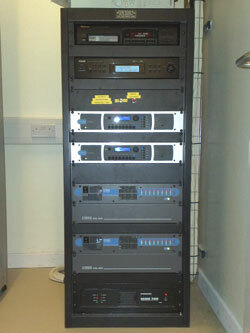 The Main Hall PA rack (below) can be operated from any two different locations, from the rear of the Main Hall, or from the rear of the Small Hall, making sure that the mix location is correct for any room configuration. Each one of these control boxes also features AV inputs for PC and Video to the projector, as well as control of the motorised Main Drapes. Through liaison with the main contractors, Mansell, these boxes were recessed into the wall, and fit flush with surrounding walls. 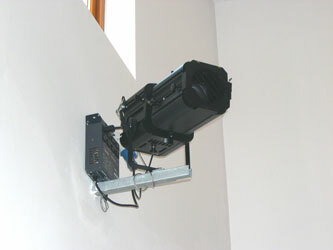 The DMX controlled Theatrical lighting system is also controlled at any one of the control locations. The twin 24 preset memory desk provides control over 6 traditional 1000W profiles, as well as a selection of LED stage luminaries. Given the lack of a void above the stage, LED lighting made perfect sense, not least for the risk of heat problems, but also in terms of the low energy and maintainence requirements. The stage drapes were also matched with the window drapes, to help co-ordinate the aesthetics of the rooms. 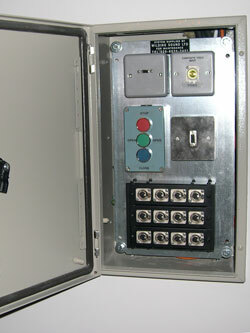 Traditional DMX dimmer packs and Profiles were used where there heat wouldn't cause a problem. 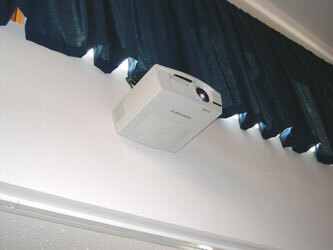 The AV projector and screen were also top of the range, with the electronic remote controlled screen being over 4 metres wide and 16:9 format. An HDMI input is fitted at the stage, whilst three other locations feature VGA and Composite video inputs, between the Main and Small Hall. 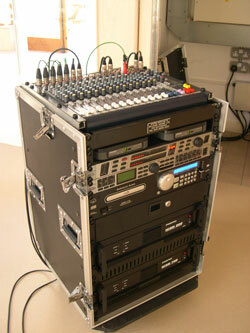 The Main Hall PA system is powered from a static rack. This powers four Deltec CX10, 500W speakers, along with two sub bass bins, featuring 2x10" bass drivers, for some serious thump, yet small enough to fit under the low stage. Power Amplifiers are Crest, along with a DBX speaker processor and X-over. The three PA systems also feature time alignment, so that, independant of the room configuration, the sound from one room gets to the audience in sync with the local rooms sound system, aiding intelligibility and sound quality. The rooms, mostly to meet insulation targets, are well insulated, and the Architects choice of final finish allows this thermal insulation to aid acoustic insulation, and minimises poor room acoustics and echo issues. The building wide PA system is equally high end, and thorough in its coverage. It features 16 independantly accessable zones, which can be paged independantly or collectively. It also features a CD and DAB radio, which can also be routed to any one or many of the 16 zones. We also built a custom School Bell system to automatically trigger an MP3 file at the predetermined times, as well as a manual override, and GMT/BST auto correct. 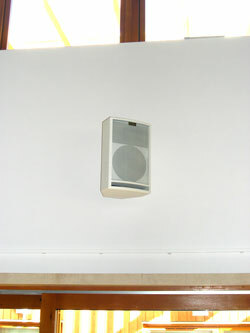 The amp rack feeds over 120 recessed ceiling speakers distributed around the school, a mixture of Penton, Toa and JBL Control for the main halls. As ever, despite the scale of the job, and other contractors delays impinging on our schedule, we completed on time and strictly to a tight budget. 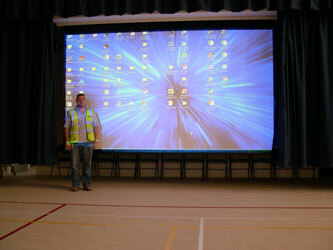 We also engineered the opening ceremony events, and provided a staff training day.